Courtesy: Greene Naftali, New York. A filthy chunk of Sunset Boulevard lies on the floor in a gallery on The Mall, thousands of miles from home, utterly isolated, totally displaced. American artist Julie Becker (1972-2016) was a displaced child herself, and a displaced adult, moving and being moved constantly. That slab of concrete of hers makes a lot of sense. The opening installation here is a ramshackle series of corridors. It starts with a waiting room: an in-between space, somewhere to think long and hard about what’s coming your way. 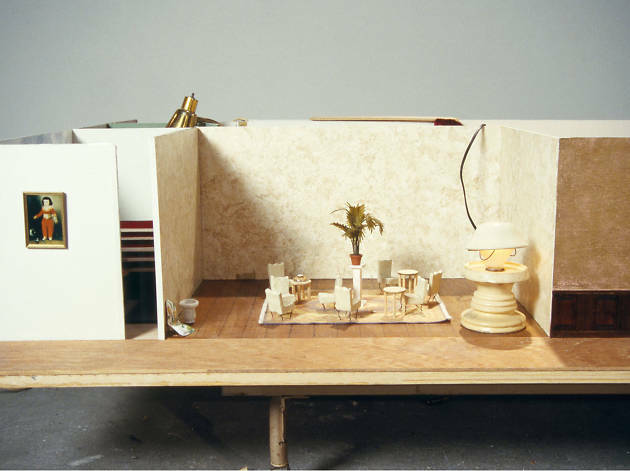 Then there’s a room filled with models of other rooms, and a final room filled with piles of furniture, flickering TVs, photo slides and beds adapted from cardboard refrigerator boxes. Is this an academic’s research office? An architect’s studio? A squat? An asylum? Upstairs you find that chunk of Sunset Boulevard surrounded by drawings of fantasy furniture and dream rooms. A screen in the corner plays ‘The Wizard of Oz’ synced with Pink Floyd’s ‘Dark Side of the Moon’. You can skip between moments, get lost in a suburban stoner’s delusional fantasy. Becker seems obsessed with the spaces around her. She reaches out constantly at them, not just in fear that these spaces might disappear, but certain in the knowledge that they will, that she will lose her home, her independence, her space. This show feels like someone’s life on display: the peeling wallpaper, the coffee machine, the TV, the depression, the addiction, the obsession of existence, the fear of eviction. Becker’s work flickers between reality and fiction, between confronting the truth of her life and building a fantasy to help her deal with it. It’s brilliant, creepy, paranoid, fun, heart-wrenchingly miserable stuff. It’s actually too personal, too much of an insight. It hurts. Becker lived – as her art does – on the verge of where the American dream tips into a nightmare. It’s art on the precipice of mental health and societal pressure. It’s terrifying because it’s real. Becker lived like this, and the awful thing is that thousands of people still do.